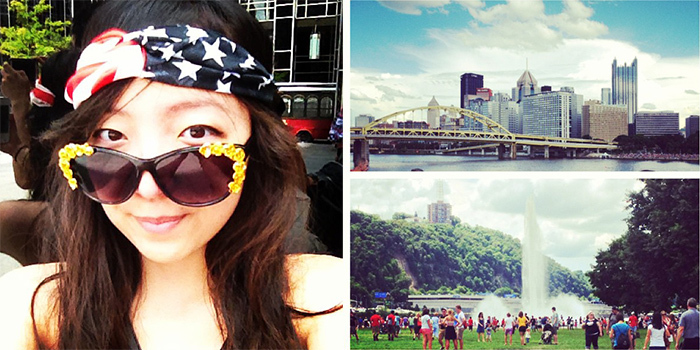 Before the calendar starts tearing pages out of itself and it's suddenly the 24th of July, here's what I wore for a sunny Fourth of July in Pitt. Though this almost-all black outfit turned out to be a stifling hot getup for the summer holiday, the way the sequins reflect light made up for the dark colours - they give off a blinding shimmer with each little movement and remind me of fireworks in the night sky. The interesting sequins are black on the top and gold on the bottom so you can run your hand through them to make the skirt more gold or more black. 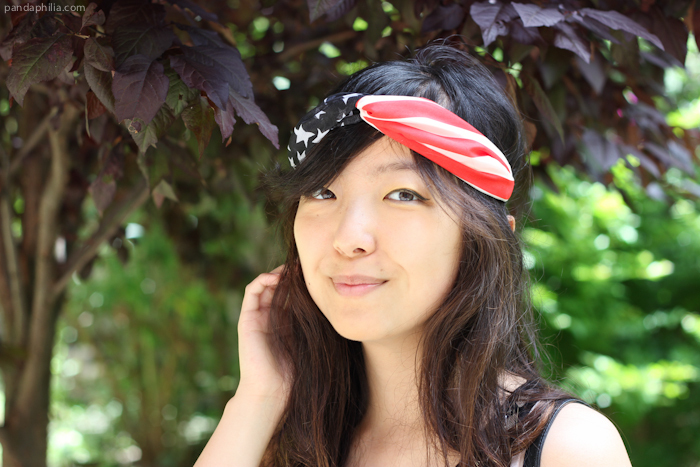 My headband was the centerpiece that shamelessly screamed "MURICAAA!!!" JJ and I set about exploring downtown, where we normally don't venture. In the park there was a giant fountain where people dipped their legs in to cool off, frisbee-catching pups, BMX-riding kids, pogo stick tricks and all kinds of entertainment. Riding the subway made me nostalgic for St. Louis and the 4th of July celebration we attended a few years back. At every turn that day we seemed to have the best luck and found seats right in front of the firework display. A long, long weekend of fun and adventures accomplished, back to researchin' and happy hourin' (repeat). I visited America recently but sadly left on the 1st. Would've loved to experience celebrating 4th July!! nice look!! 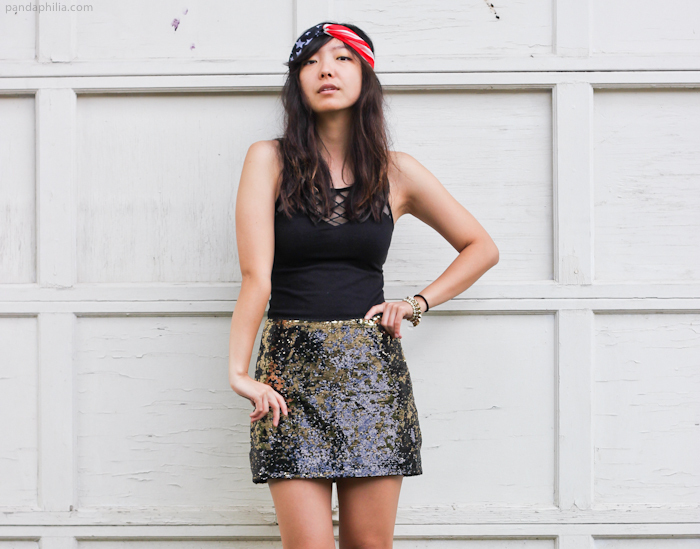 the sequin skirt surprisingly pairs well with those sandals! Angie!! What a glam look. Haha, I laughed when I saw the title--perfect! And who can resist sparkles? 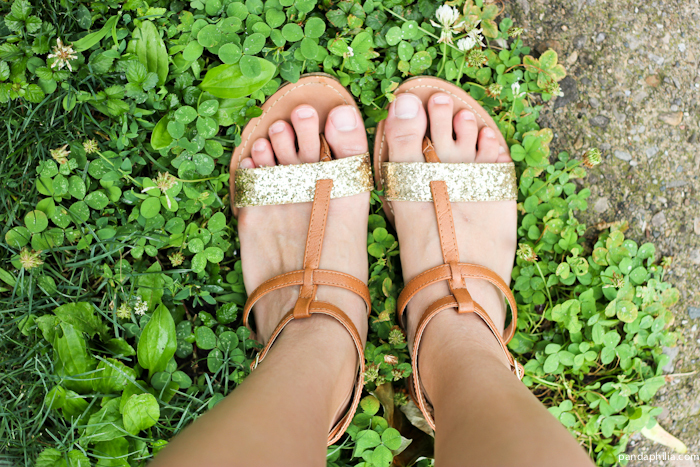 Your sandals are so cute and the edgy skirt is so stylish. You definitely rocked it on the fourth of July! Very fun look for the 4th of July! omg!! beautiful skirt!! i love it"! I miss STL 4th of July's so much too! I was actually thinking how pathetic my 4th of July was (I was building a dresser and a nightstand in the wee hours of the night for my new place in memphis lol). But wine with the fam made up for it. I like how there's also black in the sea of reds whites and blues in this outfit :) Thank you and miss you so much Angie! 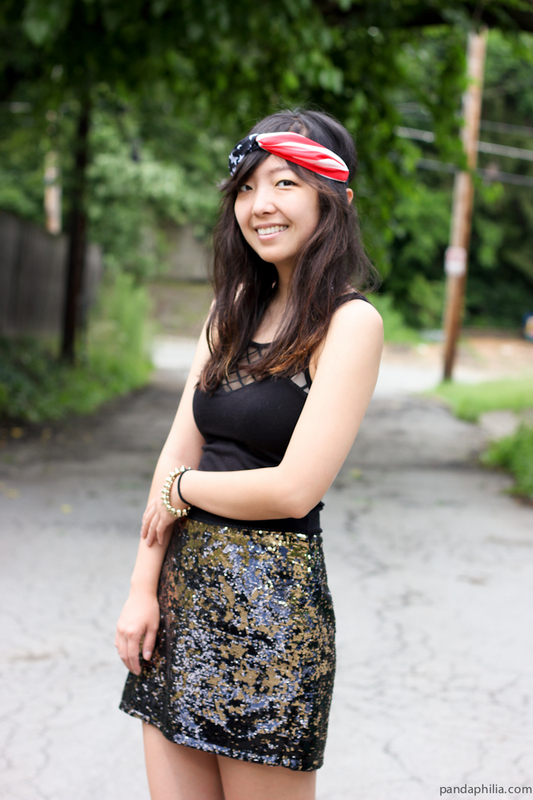 I have some freaking serious envy of you because of that skirt. It looks super cute! I love the black and then subtle hints of the gold!